Happy to announce a new publication from the lab on the immune system of honey bees in PLoS ONE. The study explored the genetic relationship between the honey bee’s innate and social immune system. The study was authored by PhD candidate Brock Harpur, with strong contributions from Anna Chernyshova and Arash Soltani – two honours thesis students in my lab (2012). MSc Candidate Nadia Tsvetkov and NSERC USRA students Mohammad and Jack (Zhixing) were instrumental in completing the field-work . Happy to announce that a regional portal of the Journal Nature, Nature Middle East, published a Research highlight story on our recent honey bee population genomics study. I am very happy to announce the publication of a new paper from the lab, which appeared last week in the Proceedings of the National Academy of Sciences (PNAS) – a top journal in the field. 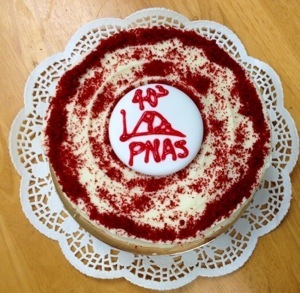 The study was featured on the cover of PNAS, and received a highlight in the “In This Issue” section of the journal. Also see York U’s press release on the article. The article was co-first authored by PhD Candidate Brock Harpur and postdoctoral fellow Dr. Clement Kent, with further contributions from MSc candidate Daria Molodostova, former Research at York undergraduate Jonathan Lebon, and two collaborators from King Saud University, Drs. Abdualziz Alqarni and Ayman Owayss. The study involved sequencing the genomes of 39 European honey bees (Apis mellifera) from their native range in Africa, Asia, and Europe. We also sequenced the genome of the Asiatic honey bee Apis cerana. We were able to identify over 12 million mutations in the European honey bee and this allowed us to identify DNA regions that have experienced positive ‘Darwinian’ selection. Positive selection refers to the evolutionary process that increase the frequency of beneficial mutations in a population, because such mutations confer an advantage to the individuals carrying them (e.g. such individuals can survive better, or reproduce more relative to others in the population). Studying selection in social insects is not straight forward because worker honey bees are effectively sterile – they do not have offspring of their own, so they can only experience positive selection indirectly; mutations that affect a worker’s helping behaviour can only spread through the population if the helping behaviour allows their mother queen to produce more queens and drones (reproductive male bees); this is called kin-selection. We set out to look for evidence of kin selection by searching for signs of positive selection on genes and proteins that affect worker traits. We find very strong evidence that genes associated with worker behaviour experience high rates of positive selection. These included Royal Jelly proteins, which are produced in specialized worker glands to feed their sisters. Indeed, the gene for royalactin, the royal jelly that workers feed to young larva to make them queens, shows very high rates of positive selection. We also found that worker biased proteins (i.e. proteins that are expressed at higher levels in workers relative to queens) experience stronger positive selection than queen-biased proteins. Our study shows that workers, through their helping behaviour, play a major role in environmental adaptation in the honey bee. In other words, ‘survival of the fittest’ in honey bees is essentially survival of the colonies with the best workers! Management and diversity in honey bees: comment and reply. De la Rúa et al. raised some comments about our recent article showing that management enhances genetic diversity in honey bees. Their comments, along with our response have been published online in Molecular Ecology. We stress that admixture does enhance genetic diversity in managed bees. New paper: the curious case of the disappearing immune genes in honey bees. We have a new paper out in Molecular Biology and Evolution. See the press release here. When the honey bee Apis mellifera genome was sequenced in 2006, researchers found that the bee has fewer innate immune genes – the genes that recognize and destroy pathogens – than other solitary insects. The bee had about 30% of the innate immune genes found in flies and mosquitos. Wow! Why? Dr. Jay Evans (USDA) and colleagues hypothesized that maybe bees have fewer pathogens, or that they can fight pathogens better with social behaviour; worker bees can groom themselves and their sisters, and they can recognize sick/dead larva and remove them from the colony. Brock Harpur, a MSc (now PhD) student in the lab is very interested in immunity in social insects, and he decided to study the evolution of 13 innate immune genes in the honey bee. We sequenced these genes in about 40 different honey bee workers, and in one worker of the closely related Asian honey bee Apis cerana. This allowed us to discover mutations in innate immune genes within the European honey bee Apis mellifera, and between the European and the Asian honey bee (Apis mellifera vs. Apis cerana). We compared the amount of mutations in innate immune genes to those found in 20 randomly chosen genes. The DNA sequence of a given gene codes for a specific sequence of amino acids that get folded into a 3-dimensional protein that then preforms a specific function within the cell. Mutations in a gene sequence come in two flavours: there are mutations that don’t change the amino acid sequence of the resulting protein (we call these silent mutations), and there are mutations that change the amino acid sequence of the resulting protein (we call these replacement mutations). The silent mutations – because they do not affect the shape and structure of the resulting protein – do not often affect fitness and are not ‘weeded-out’ by natural selection; silent mutations accumulated within species, and between species. However, replacement mutations will change the shape / structure of proteins, and often the resulting protein will not function optimally (if it works at all). These mutations, because they are often bad, are then rapidly removed by natural selection (because bees with these mutations do not survival as well). Now imagine a gene sequence that was functional in an ancestor but is now no longer necessary. Replacement mutations in such genes will no longer be weeded-out by natural selection (because bees with these mutations survival normally), and these mutations can then accumulate similar to silent mutations; this process is called ‘relaxation of purifying selection or relaxation of constraint’. This is exactly what we see when we look at most immune genes in the honey bee. When we examine silent mutations, immune genes and random genes have similar rates. However, if we examine replacement mutations, we find that immune genes have 3 to 4 higher mutations relative to random genes; this is consistent with a relaxation of purifying selection. We reckon that the same process that resulted in massive loss of innate immune genes in the bee is still acting to erode some of the remaining innate immune genes in contemporary bee populations. Our work supports Dr. Jay Evans’ idea that some aspect of social living makes an individual-based innate immune system less useful. We have a paper out this month in Communicative and Integrative Biology on the evolution of recombination rates in social insects. This follows up on our recent PNAS paper showing a relationship between recombination, GC content, and worker biased genes in the honey bee. We now present a conceptual paper on how high recombination could have been advantageous during the initial stages of the evolution of sociality, which in turn could have affected GC content in social insects. The paper was authored by Dr Clement Kent – a postdoctoral fellow in the lab. Its an open access article, so you can download it and read it for free! Recombination, GC, and worker behaviour: comment and reply. Our colleagues Drs. 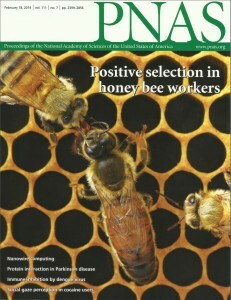 Hunt, Glastad, and Goodisman raised some comments about our recent article showing a relationship between recombination, GC content, and worker-baised genes in honey bees; Their comments, along with our response were published online this week in the Proceedings of the National Academy of Sciences. 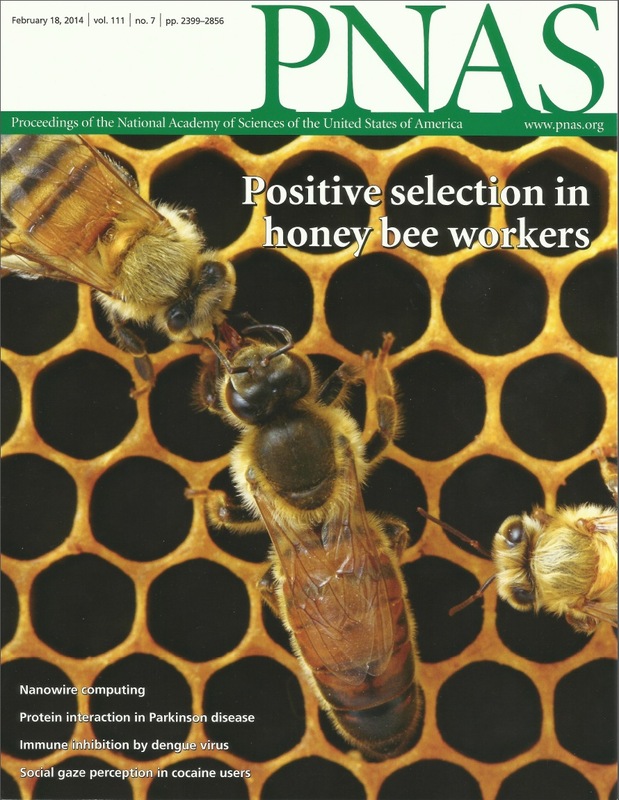 Dr. Nicolas Galtier from the Institut des Sciences de l’Evolution, Université Montpellier II, Montpellier, France, recommended our recent PNAS article on recombination and evolution in honey bees on Faculty of 1000 . Check it out! I am very happy to announce the recent publication of a collaborative review on the relationship between brain gene expression and behaviour with Dr. Gene Robinson at the University of Illinois. We reviewed a large number of studies examining changes in brain gene expression in the honey bee across a wide spectrum of behaviours, environments, and honey bee subspecies. We showed that brain gene expression is intimately linked to behaviour and that changes in brain gene expression bring about changes in behaviour. We discuss how changes in the environment as well as changes in physiology affect bee behaviour by first affecting brain gene expression. 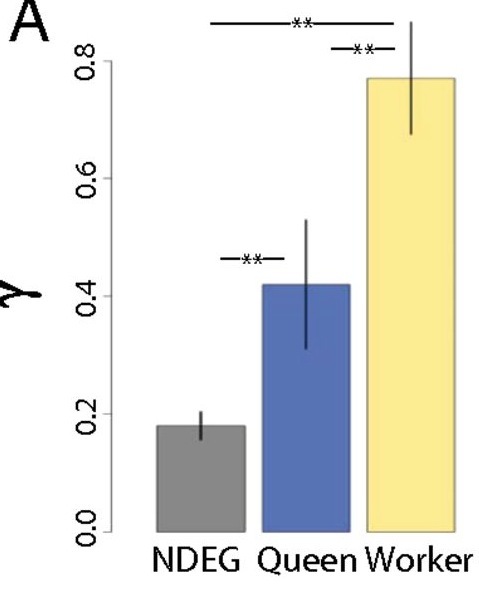 Finally, we showed that the association between specific genes and behaviour can be highly conserved over evolutionary time, leading to common basis of behaviour across distantly related animals. Zayed A, Robinson GE (2012) Understanding the relationship between brain gene expression and social behavior: Lessons from the honey bee. Annual Review of Genetics 46, 591-615. Postdoctoral or Research Associate Position in genomics and bioinformatics at York University, Toronto, Canada. Similar social behaviour, Similar Genes? New Paper – NNIs and the poisoned oasis!